Who’s Playing Hide-and-Seek In Your House? Credit: M. Bertone et al. Have you every tallied how many “roommates” you really have living in your house right now? I don’t mean human, but those tiny little creatures you might have never noticed before. I don’t want to scare you, but their numbers afar beyond your imagination! Recently, a group of researchers (Bertone, Trautwein, Shipman, NC State University) have visited and collected a wealth of information of any living or dead arthropod that they could find from sampled homes in North Carolina. Their data uncovered that “Each house could play host to many hundreds of arthropod species, with an average tally per home about 100 species representing 62 arthropod families,” (Mindy Weisberger). 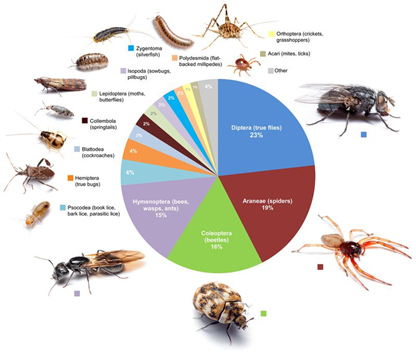 The majority (73%) of found species are familiar to human such as bedbugs, termites, spiders, beetles. More surprisingly, scientists have complied a list of 579 species from all houses (304 families) and it is said that the list is probably just a tip of an iceberg! This sounds a little creepy isn’t it? The good news from the report –fortunately –is that the vast majority of our “company” are not pest species! “They were either peaceful cohabitants like the cobweb spiders found in 65% of all rooms sampled –or accidental visitors, like midges and leafhoppers” (Matt Bertone et al, NC State News). It is not true that our “roommates” really want to spend time with us, in fact many of them were accidentally brought from outside the house by humans, and because they are not equipped with their necessities or adaptive environment, they usually expired rapidly. As the research has been made, we should now be aware of how diverse our living environment is, and it might be amusing for us to discover where our hidden “friends” are in our own rooms. Weisberger, By Mindy. “Hundreds of Tiny Bugs Are Probably Hiding in Your Home.” LiveScience. TechMedia Network, 19 Jan. 2016. Web. 13 Feb. 2016. Resnick, Brian. “First Study of Arthropods in U.S. Homes Finds Huge Biodiversity.” NC State News First Study of Arthropods in US Homes Finds Huge Biodiversity Comments. Feb. 2016. I am a fourth year student at Ohio State. This past semester I took an introductory plant pathology class that opened my eyes to how prevalent plant diseases are. Every calorie we eat ultimately came from a plant. Think of something you eat that can’t be traced back to a plant. Crop plants are essential to the existence of mankind and the diseases that are threatening them do not get enough attention. In “Tracking wheat rust requires $108 million a year, study shows,” Philip Pardey, a professor in the Department of Applied Economics at the University of Minnesota, makes an argument for perpetual funding for wheat rust research. He mentions the Red Queen hypothesis (Through the Looking Glass), you must run as fast as you can, and how it applies to plant diseases. Pradey says in the article, “the very seeds of success of wheat breeders sow their own destruction” – meaning you can spend millions of dollars to develop a resistant cultivar or new fungicide, but eventually that disease will overcome that resistance. Pardey found that it would take a 108 million dollars spent on research to stay on top of the three major rust diseases on wheat. If that $108 million is divided by the area of wheat planted, it adds up to $.51 per hectare. $108 million dollars might sound like a lot, because it is, but Pardey determined that rust causes about 2.9 billion dollars in damages every year. Rust and all other plant disease aren’t just going to disappear, there needs to be ongoing research to have any chance of prevention a catastrophic event. Do not underestimate this plant killer! Did you know that mold can attack plants? White mold (Sclerotinia) is a disease that can attack many plant species and cause severe yield loss. White mold is most commonly found in areas that have cool, moist conditions. Some of the most economically important hosts of this disease are soybeans, most vegetable crops, tobacco, sunflowers, canola, and stone fruits. It is important to diagnose plant diseases accurately and quickly. Early signs of white mold are water soaked lesions and possible above ground tissue shredding on the plant. White mold will then produce white colored mycelium, a cotton looking substance, on the plant. When the mold is ready to start reproduction, it forms mycelium clumps. These mycelium clumps will eventually form into reproductive structures called sclerotia which are hard black structures. These sclerotia overwinter in the soil to infect future crops. What can I do to control white mold? A few options for management of white mold include crop rotation, canopy management, irrigation control, fungicides, and weed control. Crop rotation and weed control removes host plants, however, it takes several years of non-host crop planting for full control. Canopy management and irrigation control removes the diseases ideal environmental conditions by keeping moisture levels under control. Fungicides are another good option to prevent infection or after infection when other controls cannot save a harvest. White mold is an easily overlooked disease that can become economically crippling if left to run rampant. It is important to diagnose this disease correctly and put a stop to it before reproduction starts to protect your crops this year and for years to come. Coffee is a way of life in much of Nicaragua, the second poorest country in the world. Farmers grow and harvest the berries, the berries are de-pulped, and then dried to be exported, or roasted in country. In the past few years there has been an increase in the occurrence of rust (Hemileia vastatrix) outbreaks in the coffee plantations, threatening families and the economy of the country. Rust in coffee is a fungus that grows on the leaves and spreads to the berries. It begins by turning the leaves orange in spots, progressing to dead tissue and holes in the leaves. The fungus then transitions and turns the bright red berries to grey. Rust has come in waves since the 1970s but it mutates each time it reappears making it difficult to find a treatment that is effective. The only treatment known is to prune the plants and use fungicide, however, there is no reliable data documenting the effectiveness of the fungicides on this rust. The farmers that can afford it have treated the rust with fungicides in hopes to save a portion of their harvest. The increase of rust in recent years is thought to be caused by climate change. Farmers in Nicaragua grow coffee on the mountain, where the temperature is lower than rust can thrive in. However, an increase in precipitation and temperature at those elevations creates the perfect conditions for the fungus. I visited Nicaragua in January of 2015 and saw how desperate farmers are for answers and a solution to save their way of life. Research is being done on resistant coffee plants but the replacement process would take years and is very expensive. Last year, a disease that has never been seen in the United States before made its debut on corn plants in the Midwest. Farmers began to notice brown lesions and small black spots appearing on the leaves of their corn. The effects of this mysterious disease were unknown, and there was no application known to stop its spread. 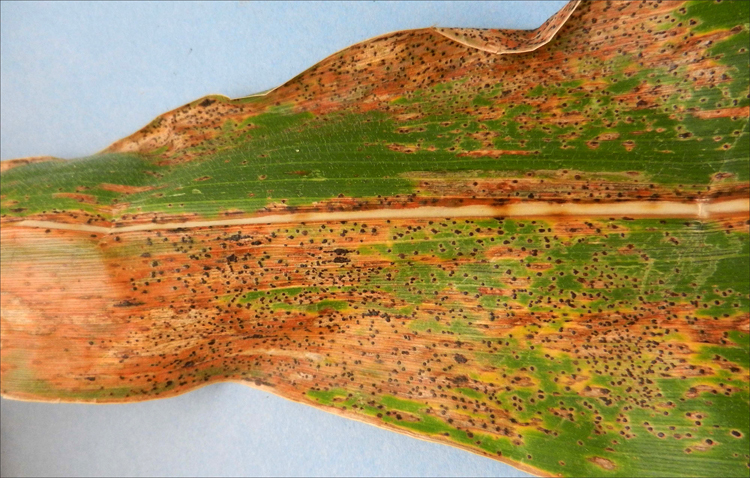 After analyzing samples of plants infected by the disease, researchers have discovered that it is Tar Spot, a disease that mainly infects the leaves of the corn plant. The fungus has existed in Mexico but has never before been seen in the United States. Phyllachora maydis is the pathogen that causes this disease, and is suspected to have arrived here through the high speed winds of a hurricane or storm. Plants infected with tar spot typically will have necrotic areas and brownish lesions on the leaves. On these lesions, are the small black spots that resemble tar and give this disease its name. These spots can also appear on the corn husks. Fortunately, the worst that Corn Tar Spot will do is slightly reduce yields and lower the aesthetic appeal of a corn field. Another reason to not worry too much about this disease is that the fungus doesn’t overwinter well on dead plant matter because it requires warm weather to survive, and winter temperatures in the Midwest should be cold enough to kill it. Although Tar Spot is a relatively weak disease, the quick response of farmers and researchers in discovering and identifying it is what is necessary to protect the harvest from total devastation. The next new disease discovery could be powerful enough to wipe out an entire crop, so speedy identification and control is imperative to both farmers and scientists.